God has lifted the veil between Heaven and Earth. Caught up by the Spirit of God, Kat Kerr was taken on tours of Heaven for over 10 years and now commissioned to reveal the truth through an ILLUSTRATED book. The Foreword (a prophetic Word from God) was dictated to the author by two Scribe Angels. 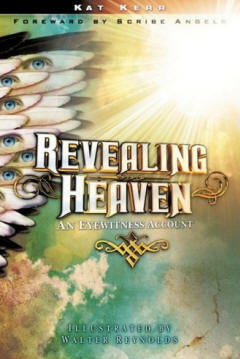 Through the ten illustrations in Volume I of Revealing Heaven, you will visit The Portal, where the Redeemed in Heaven go to view their loved ones on Earth, you will see The Rush, Heaven's largest roller coaster and visit the Nurseries for miscarried and aborted babies; and MUCH MORE! This book also explains God's design for Earth, which is a SHADOW of Heaven. Besides detailed descriptions of the mansions she walked through, Kat shares about three individuals (one a teenager) she saw while in Heaven and how this information impacted their families upon her return to Earth. PREPARE to be FOREVER changed and receive HOPE for Eternity!